It is back to school season. One thing many people do when preparing for school is to buy new school clothes and new school supplies. Where will you put the new items? What do you do with the old clothes and the old supplies? Are you someone who keeps them for later (“One day I might need them”) or are you one who gets rid of anything the moment it is replaced? Clutter happens over time. Slowly, as new items are added, things pile up if old, worn out, less-usable ones are not discarded in one way or another. Clutter can happen fast without you even realizing it. At some point you will see your car or living space in a new light and decide now is the time to declutter. Where do you start when you make that decision? Some look for decluttering tips and ideas. There are so many different theories about what to do and how to do it. Depending on your personality and way of accomplishing big projects, you may veer toward one method or another. I have shared a 30 Day/300 Item Declutter Challenge as well as a decluttering chart to help with my process. This challenge only requires you to declutter 10 items a day. With the chart you are able to choose which location you want to work in each day. This way works for me because I have so many other responsibilities and kids to tend to during the day. I can get 10 items done fast, feel like I have accomplished something and then move on to my other daily duties. Does this item make me smile?Each item you have should make you smile. Each item should make you happy. If you do not want to see other people when you wear a certain shirt perhaps it doesn’t make you smile and you should pass it on. If you have a chair that you do not like sitting in perhaps you should pass it on. Note, you have choices with ‘passing it on.’ You can pass it on to the garbage or recycle or you can give it to a local charity. Does this item have a home?If everything has a place it will be returned to its home and will not cause clutter. If an item does not have a place to call home it will have an extreme case of wanderlust. It will travel from place to place and cause clutter everywhere it goes. If you want to keep an item make sure it has a home. Let me digress for a moment – when addressing “everything has to have a home”, it does not mean that you find ways to store your belongings. Adding more storage drawers, for example, is not the solution. Perhaps better organizing a closet so you can see those items that make you smile would be a positive move. But, again, more items in a space may put items out of your view and thus they won’t really get used…so why keep them. Take a critical look at your living spaces and your car. Perhaps take a few pictures and peruse them for a few minutes. Does your space make you happy? If not, try decluttering and having the items that make you happy stand out and shine. Your life will be better. 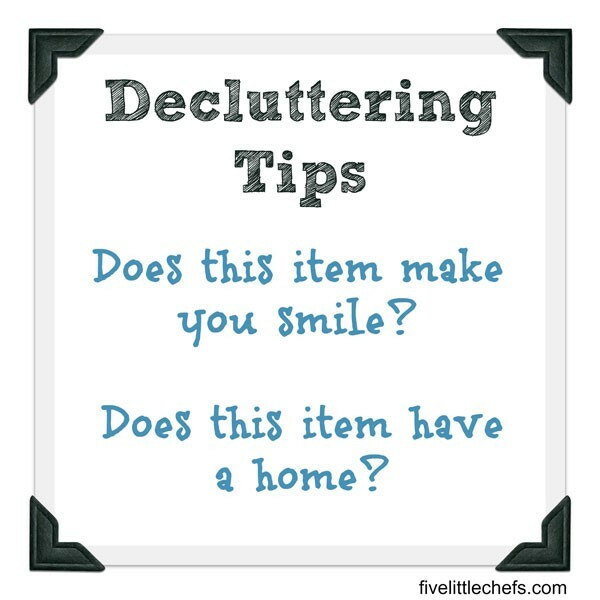 I am off to ‘make me smile’ in my living room…..
No Replies to "Decluttering Tips"